Celiac disease (CD) is a gluten-sensitive enteropathy associated with a marked infiltration of the mucosa with IFN-γ–secreting Th1 cells. Recent studies have shown that a novel subset of T cells characterized by expression of high levels of IL-17A, termed Th17 cells, may be responsible for pathogenic effects previously attributed to Th1 cells. In this study, we characterized the expression of IL-17A–producing cells in CD. By real-time PCR and ELISA, it was shown that expression of IL-17A RNA and protein is more pronounced in active CD biopsy specimens in comparison with inactive CD and normal mucosal biopsy specimens. Flow cytometry confirmed that IL-17A is overproduced in CD mucosa and that CD4+ and CD4+CD8+ cells were major sources. The majority of IL-17A–producing CD4+ and CD4+CD8+ cells coexpressed IFN-γ but not CD161. The addition of a peptic‑tryptic digest of gliadin to ex vivo organ cultures of duodenal biopsy specimens taken from inactive CD patients enhanced IL-17A production by both CD4+ and CD4+CD8+ cells. Because we previously showed that IL-21, a T cell-derived cytokine involved in the control of Th17 cell responses, is overproduced in CD, we next assessed whether IL-17A expression is regulated by IL-21. Blockade of IL-21 activity by a neutralizing IL-21 Ab reduced IL-17A expression in cultures of active CD and peptic–tryptic digest of gliadin-treated CD biopsy specimens. In conclusion, our data show that IL-17A is increased in CD and is produced by cells that also make IFN-γ. Celiac disease (CD) is a lifelong gluten-sensitive enteropathy. The typical histological features of CD include atrophy of the small intestinal villi, hyperplasia of the crypts, and a marked infiltration of the lamina propria and intraepithelial compartments with inflammatory cells. Normality is regained when foods containing gluten are excluded from the diet (1, 2). Both adaptive and innate immune reactions are thought to trigger and propagate the mucosal inflammation (1, 3). In particular, several studies have shown that CD4+ T cells play a major role in initiating and shaping the pathologic response in CD (1, 2). The ability of CD4+ T cells to alter the magnitude and outcome of the intestinal inflammatory responses is largely dependent on the production of distinct profiles of cytokines (1, 4). Traditionally, the CD lesion has been associated with a predominant activation of Th1 lymphocytes that express high levels of the Th1-associated transcription factor T-bet and produce large quantities of IFN-γ (4, 5). There is also evidence suggesting that IFN-γ may be involved in CD-related tissue damage. Indeed, neutralization of IFN-γ prevents the gliadin-induced morphological changes in an ex vivo organ culture of CD biopsy specimens (6). More recently, there has been the identification of more complex networks of cytokine interactions involving a distinct subset of Th cells, namely, Th17 cells, in the pathogenesis of various immune-mediated disorders, including inflammatory bowel diseases, rheumatoid arthritis, and psoriasis (7–12). Th17 cells, as their name suggests, produce IL-17, also termed IL-17A (7, 8). The inflammatory properties of these cells are strictly linked to their abilities to enhance the recruitment and facilitate the activation of neutrophils, to stimulate the production of chemokines and other inflammatory cytokines, and to promote the synthesis of tissue-damaging proteases (9). Th17 cells rather than Th1 cells may therefore have key roles in many of the pathologies thought to be due to Th1 cells. In this context, it is however noteworthy that IL-17A has been reported to act directly on effector T cells and inhibit the expression of factors that coordinate Th1 cell differentiation (13). Consistently, a lack of IL-17A accelerates the development of a severe Th1 cell-induced inflammation in the adoptive transfer model of colitis (13). Therefore, at least under specific circumstances, IL-17A could exert protective rather than inflammatory effects in the gut. We have recently shown that IL-21, a Th17 cell-derived cytokine (14) that promotes Th17 cell development (15), is produced in excess in CD (16). These observations raise the possibility that Th17 cells may contribute to modulate the ongoing inflammatory response in CD. To begin to address this issue, we investigated whether IL-17A, the signature cytokine of Th17 cells, is associated with CD. Our data indicate that IL-17A is highly produced in the inflamed gut of patients with CD and that CD4+ and CD4+CD8+ T cells are major sources of this cytokine. The vast majority of IL-17A–producing T cells also express IFN-γ. Finally, we show that IL-21 positively controls IL-17A expression. Biopsy specimens from the duodenum of 27 patients with active CD, 19 patients with inactive CD, and 26 healthy controls were obtained during upper gastrointestinal endoscopy. The histopathological diagnosis of CD was based on typical mucosal lesions with crypt cell hyperplasia and villous atrophy. All of the active CD patients were positive for anti-endomysial and anti-transglutaminase Abs at the time of diagnosis. Biopsy specimens were also obtained from inactive CD patients who adhered to a strong gluten-free diet for at least one year (range, 12–18 mo; average, 15 mo). All of these patients were in clinical and histological remission and negative for anti-endomysial and anti-transglutaminase Abs. Normal controls were under investigation for gastrointestinal symptoms but had normal histology and no increase in inflammatory cells and were anti-endomysial and anti-transglutaminase Ab negative. Informed consent was obtained from all of the patients and controls, and the study protocol was approved by the Ethics Committee of the University Hospital Tor Vergata of Rome. Duodenal biopsy specimens were taken from five active CD patients, six inactive CD patients, and six normal controls and cultured in RPMI 1640 supplemented with 10% FBS, penicillin (100 U/ml) and streptomycin (100 mg/ml). All of the reagents were from Sigma-Aldrich (St. Louis, MO) unless specified. Biopsy specimens from active CD patients were either left untreated or treated with a neutralizing monoclonal anti-human IL-21 (17) or control Ab (IgG; both used a final concentration of 10 μg/ml). The biopsy specimens were placed on iron grids in the central well of an organ culture dish, and the dishes were placed in a tight container with 95% O2/5% CO2 at 37°C and 1 bar. Duodenal biopsy specimens taken from inactive CD patients were cultured with a peptic–tryptic digest of gliadin (PT; 1 mg/ml) or untreated BSA (1 mg/ml) in the presence or absence of the anti-human IL-21 or control IgG. After being cultured for 24 h, tissue explants were used for examining IL-17A RNA by real-time PCR. In parallel experiments, the cultured biopsy specimens were used to isolate lamina propria mononuclear cells (LPMCs). IL-17A RNA transcripts were analyzed by real-time PCR in duodenal biopsy specimens of 13 active CD patients, 7 inactive CD patients, and 12 normal controls. IL-17 was also evaluated in biopsy specimens cultured as indicated above. RNA was extracted by using TRIzol reagent according to the manufacturer’s instructions (Invitrogen, Carlsbad, CA). A constant amount of RNA (1 μg per sample) was reverse-transcribed into cDNA, and this was then amplified using the following conditions: denaturation 1 min at 95°C, annealing 30 s at 62°C for both human IL-17A and human β-actin, followed by 30 s extension at 72°C. Primer sequences were as follows: IL-17A, forward, 5′-ACT ACA ACC GAT CCA CCTCAC-3′, reverse, 5′-ACT TTG CCT CCC AGA TCACAG-3′; β-actin, forward, 5′-AAGATGACCCAGATCATGTTTGAGACC-3′, reverse, 5′-AGCCAGGTCCAGACGCAGGAT-3′. β-actin was used as a housekeeping gene. Gene expression was calculated using the ΔΔCt algorithm. LPMCs were isolated from duodenal biopsy specimens of 14 active CD patients, 8 inactive CD patients, and 10 normal controls as previously described (18). Additionally, LPMCs were isolated from inactive CD biopsy specimens cultured with PT or untreated BSA. For analysis of IL-17A expression in γ/δ+ cells, intraepithelial lymphocytes (IELs) were isolated as described elsewhere (19).Freshly isolated LPMCs and IELs were phenotypically characterized by flow cytometry using the following Abs: anti–CD4-PerCP (1:50, final dilution), anti–CD8-FITC (1:50, final dilution), anti–TCR-γ/δ-PE (1:50 final dilution), anti–CD161-PE (1:50, final dilution), and anti–CD3-FITC (1:50, final dilution). All of the Abs were from BD Biosciences (San Jose, CA). LPMCs and IELs were resuspended in RPMI 1640 medium, supplemented with 10% inactivated FBS, penicillin (100 U/ml), and streptomycin (100 μg/ml), seeded in 96-well U-bottom culture dishes, and stimulated with PMA (10 ng/ml), ionomycin (1 μg/ml), and brefeldin A (10 μg/ml; eBioscience, San Diego, CA). After 5 h, cells were stained for CD3, CD4, and CD8 using the above Abs as well as for IFN-γ, IL-17A, and IL-22 using the following Abs: anti–IFN-γ–PE (1:50, final dilution; BD Biosciences), anti–IL-17A–allophycocyanin (1:50 final dilution; eBioscience), and anti–IL-22–allophycocyanin (1:50 final dilution, eBioscience). Appropriate isotype-matched controls from BD Biosciences were included in all of the experiments. Total proteins were extracted from duodenal biopsy specimens as previously described (16). Briefly, snap-frozen mucosal samples were homogenized in buffer containing 10 mM HEPES (pH 7.9), 10 mM KCl, 0.1 mM EDTA, and 0.2 mM EGTA, supplemented with 1 mM DTT, 10 μg/ml aprotinin, 10 μg/ml leupeptin, and 1 mM PMSF. Proteins were analyzed for the content of IL-17 using a sensitive ELISA kit according to the manufacturer’s protocol (PeproTech, Rocky Hill, NJ). Differences between groups were compared using Student t tests. IL-17A RNA expression was significantly higher in CD patients with active disease than in patients on a gluten-free diet and controls (p = 0.001 and p < 0.001, respectively) (Fig. 1A). To confirm these results, IL-17A was also evaluated in protein extracts prepared from biopsy specimens of CD patients and controls by ELISA. IL-17A protein expression was higher in active CD samples in comparison with that in controls (Fig. 1B). Increased IL-17A expression in active CD. A, Expression of IL-17A RNA transcripts in mucosal samples taken from 12 controls, 7 inactive CD patients, and 13 active CD patients as measured by real-time PCR. Levels are normalized to β-actin. Data indicate mean ± SD of all of the experiments. B, IL-17A protein expression in total extracts prepared from duodenal biopsy specimens of three controls, three inactive CD patients, and three active CD patients as evaluated by ELISA. Data are expressed as picograms per 200 μg total proteins. Data indicate mean ± SD of the all experiments. IL-17A is mostly produced by T cells (20), thus the differences in IL-17A expression between active CD patients and controls could be due to the higher numbers of T cells in CD mucosa. By flow cytometry, we confirmed that the fraction of lamina propria CD3+ T cells was significantly higher in active CD mucosa than that in controls (Fig. 2A). 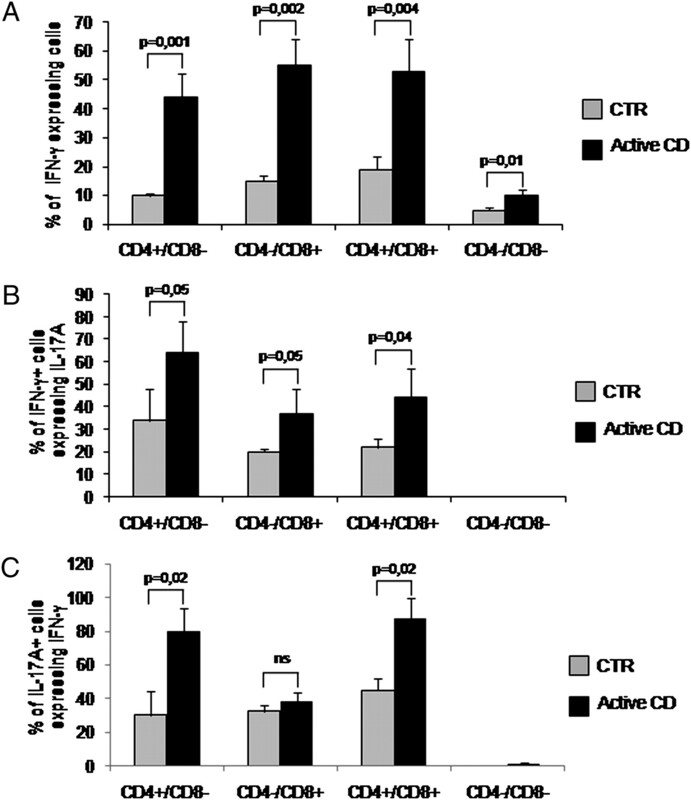 Further analysis revealed that in active CD there were more CD4+, CD4−CD8+, and CD4+CD8+ cells and fewer CD4−CD8− cells as compared with controls (Fig. 2B). A, Percentages of CD3+ T cells in LPMCs isolated from duodenal biopsy specimens of four normal controls, four inactive CD patients, and four active CD patients. Cells were stained with anti-CD3 Ab and analyzed by flow cytometry. Data indicate mean ± SD of all of the experiments. B, Percentages of CD4+/CD8−, CD4−CD8+, CD4+CD8+, and CD4−CD8− cells in LPMCs isolated from duodenal biopsy specimens of eight normal controls, eight inactive CD patients, and seven active CD patients. LPMCs were stained with anti-CD4 and anti-CD8 Abs and assessed by flow cytometry. Data indicate mean ± SD of all of the experiments. CD3+ and CD3− cells produced IL-17A in both active CD patients and controls, even though IL-17A was mostly produced by CD3+ cells (Fig. 3A). Moreover, the fractions of CD3+ and CD3− cells expressing IL-17A were significantly higher in active CD patients than those in inactive CD patients and normal controls (Fig. 3A). We next determined the percentages of cell subsets positive for IL-17A. CD4+CD8− and CD4−CD8+ cells expressed IL-17A, and the percentages of both of these cell types were significantly higher in active CD than those in controls (Fig. 3B). IL-17A was also produced by CD4+CD8+ cells, particularly in active CD (Fig. 3B). It has been reported that human Th17 cells express CD161, a member of the NKR-P1 family, which is also present on almost all NK cells and on a subset of T cells with the memory phenotype (21). Thus, we next evaluated whether, in CD, Th17 cells are positive for CD161. Fig. 3C, left panel, shows a representative dot plot in which it is evident that, in active CD mucosa, CD161 was expressed by CD4+, CD8+. and CD4+CD8+ cells. Among CD161+ cells, ∼40% expressed IL-17A, whereas >90% of IL-17A–producing cells were CD161− (Fig. 3C, right panel). During bacterial infections, IL-17A also can be produced by γ/δ T cells (22), a subset of lymphocytes that has been involved in the pathogenesis of CD (23, 24). Consistent with this, we showed that γ/δ+ IELs expressed IL-17A in active CD but to a lesser extent than γ/δ− IELs (Fig. 3D). IL-17A is preferentially made by CD3+ cells in the human duodenum. A, Percentages of CD3+ and CD3− cells expressing IL-17A. LPMCs were isolated from duodenal mucosal samples of four normal controls, four inactive CD patients, and four active CD patients and stained with anti-CD3 and anti–IL-17A Abs and then analyzed by flow cytometry. Data indicate mean ± SD of all of the experiments. Representative histograms showing the expression of IL-17A in CD3+ cells gated in duodenal LPMCs of one normal control, one inactive CD patient, and one active CD patient (right insets). Numbers above the lines indicate the percentages of IL-17A+CD3+ cells. 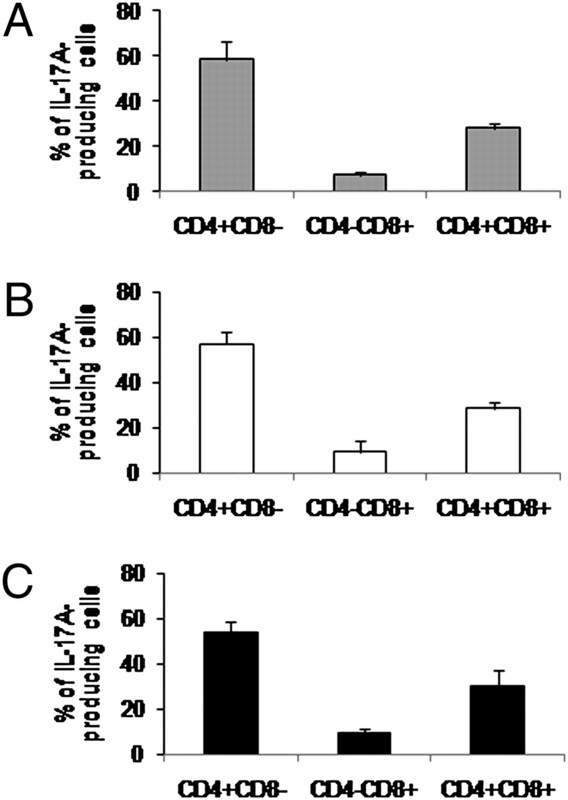 B, Percentages of CD4+CD8−, CD8+CD4−, and CD4+CD8+ cells expressing IL-17A. Duodenal LPMCs isolated from eight normal controls, eight inactive CD patients, and seven active CD patients were stained with anti-CD4, anti-CD8, and anti–IL-17A Abs, and then evaluated by flow cytometry. Data indicate mean ± SD of all of the experiments. C, Representative dot-plot showing the expression of CD161 in CD4+, CD8+, or CD4+CD8+ LPMCs isolated from the duodenum of one patient with active CD as assessed by flow cytometry (left panel). Numbers in the quadrants indicate the percentages of CD4+, CD8+, CD4+CD8+ cells expressing CD161. Representative dot-plot showing the expression of IL-17A and CD161 in LPMCs isolated from the duodenum of one patient with active CD (right panel). Numbers in the selected areas indicate the percentage of IL-17A+ cells that are also CD161− and the percentage of CD161+ cells that are also IL-17A+. D, Distribution of IL-17A in CD mucosal γ/δ− and γ/δ+ IELs. IELs were isolated from duodenal mucosal samples of three active CD patients, stained with anti-CD3, anti–TCR-γ/δ, anti–IL-17A Abs, and then evaluated by flow cytometry. Data indicate mean ± SD of all of the experiments. Finally, we evaluated the net contributions of CD4+ and CD8+ cells to the production of IL-17A. As shown in Fig. 4, >50 and 25% of IL-17A–producing cells were CD4+CD8− and CD4+CD8+ cells, respectively, whereas <10% of IL-17A+ cells were CD8+ cells. This distribution was evident in both active CD and controls. Distribution of IL-17A–producing cells in duodenal mucosal CD4+, CD8+, or CD4+CD8+ cells. LPMCs were isolated from duodenal mucosal samples of eight normal controls (A), eight inactive CD patients (B), and seven active CD patients (C), stained with anti-CD4, anti-CD8, and anti–IL-17A Abs, and then analyzed by flow cytometry. IL-17A+ LPMCs were gated and evaluated for the expression of CD4, CD8, or both. Further experimentation was performed to evaluate whether IL-17A–producing cells coexpress IFN-γ. First, we showed that the percentages of cells expressing IFN-γ were significantly higher in active CD mucosa than in controls, and this was evident in all of the cell subsets analyzed (Fig. 5A). However, the major sources of IFN-γ were cells expressing CD4. CD8, or both in active CD and controls. 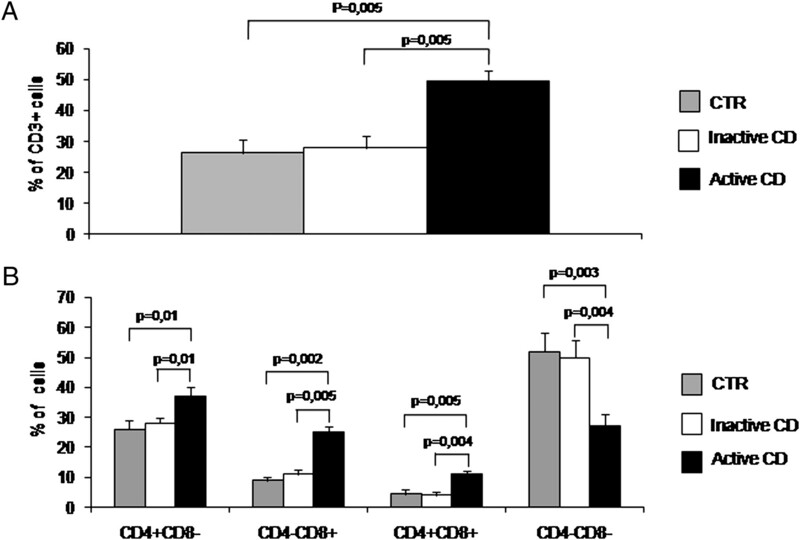 In particular, in active CD, >40% of CD4+CD8−, CD4−CD8+, and CD4+CD8+ cells produced IFN-γ (Fig. 5A). Second, we showed that, in active CD, >50% of IFN-γ–producing CD4+CD8− cells coexpressed IL-17A, whereas the fractions of CD4−CD8+ and CD4+CD8+ cells coexpressing IFN-γ and IL-17A were ∼30 and 40%, respectively. These percentages were significantly higher than those seen in controls (Fig. 5B). By contrast, IL-17A was not expressed by IFN-γ–producing CD4−/CD8− cells in CD patients and controls (Fig. 5B). Surprisingly, more than two-thirds of IL-17A–expressing CD4+CD8− and CD4+CD8+ cells produced IFN-γ in CD (Fig. 5C). Moreover, ∼30% of CD4−CD8+ cells positive for IL-17A expressed IFN-γ, whereas CD4−/CD8− cells coexpressing IL-17A and IFN-γ were barely detectable in both CD patients and controls (Fig. 5C). The majority of IL-17A–producing CD4+, CD8+, or CD4+CD8+ cells coexpress IFN-γ. 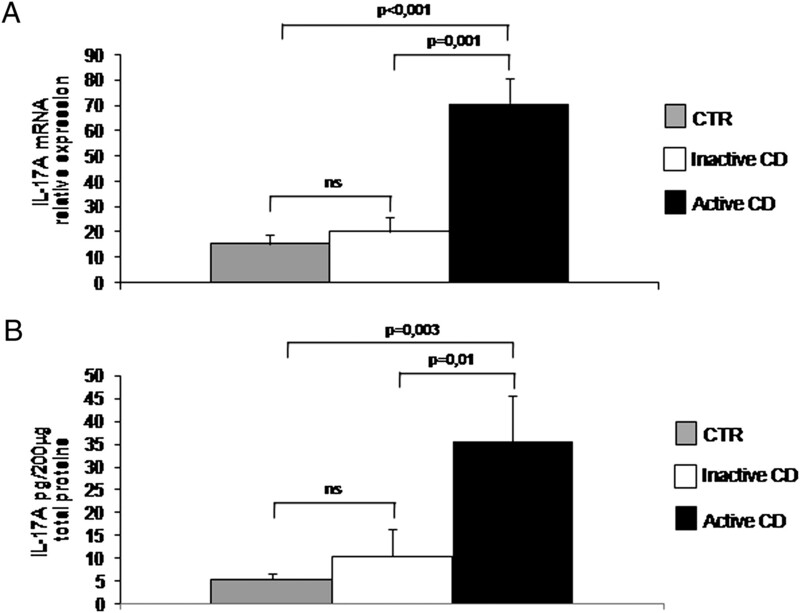 A, Percentages of mucosal duodenal cells positive for IFN-γ. LPMCs were isolated from eight normal controls and seven active CD patients, stained with anti-CD4, anti-CD8, and anti–IFN-γ Abs, and examined by flow cytometry. Data indicate mean ± SD of all of the experiments. B, Percentage of IFN-γ+ cells expressing IL-17A. LPMCs were isolated from eight normal controls and seven active CD patients, stained with anti-CD4, anti-CD8, anti–IFN-γ, and anti–IL-17A Abs, and then evaluated by flow cytometry. Data indicate mean ± SD of all of the experiments. C, Percentages of IL-17A+ cells expressing IFN-γ. LPMCs were isolated from eight normal controls and seven active CD patients, stained as described above, and evaluated by flow cytometry. Data indicate mean ± SD of all of the experiments. IL-22, a cytokine highly expressed by Th17 cells, has been reported to either promote (25, 26) or suppress (27, 28) chronic inflammation in various organs. To evaluate whether IL-22 is also made in excess in CD, we isolated LPMCs from biopsy specimens of active CD patients and controls and analyzed IL-22 expression in CD3+ cells by flow cytometry. The percentage of IL-22+ cells did not significantly differ between CD patients (2.65 ± 1.1) and controls (2.7 ± 0.9). We next carried out ex vivo organ cultures of explants of CD mucosa and examined whether mucosal cells respond to gliadin stimulation with enhanced production of IL-17A. We stimulated biopsy specimens of inactive CD patients and normal controls with PT or BSA for 24 h and then examined the levels of IL-17A RNA by real-time PCR. In explants from inactive CD biopsy specimens but not controls, stimulation with PT but not BSA enhanced IL-17A (Fig. 6A). To characterize the cell source of IL-17A in these cultures, LPMCs were isolated from the mucosal explants at the end of the experiment and analyzed simultaneously for IL-17A, CD4, and CD8. The representative dot plots in Fig. 6B show that treatment of inactive CD biopsy specimens with PT but not BSA markedly enhanced the fractions of CD4+ and CD4+CD8+ cells expressing IL-17A. 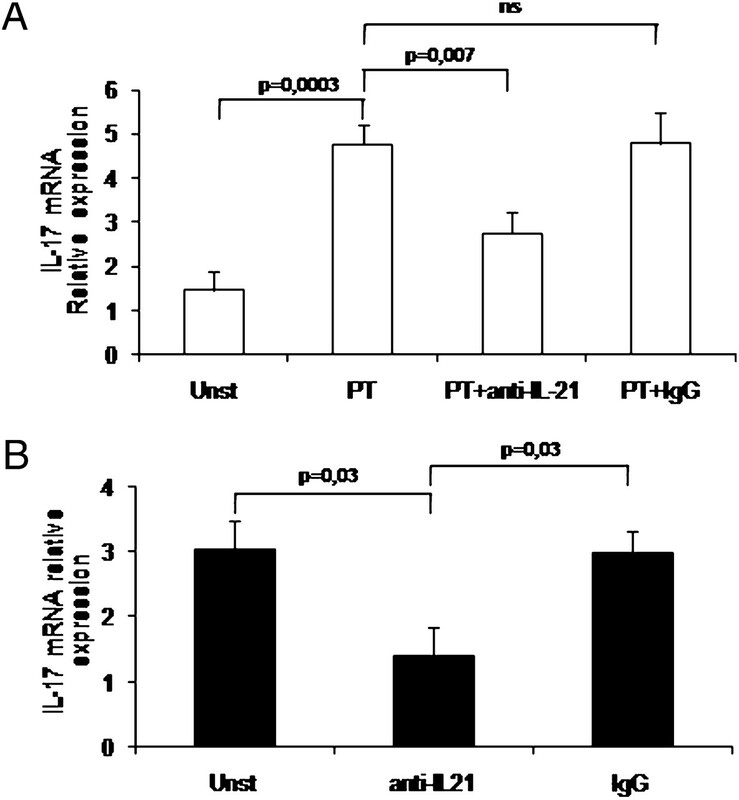 In contrast, the percentages of CD8+ and CD4−/CD8− cells that expressed IL-17A were slightly increased by PT (Fig. 6B). Challenge of inactive CD biopsy specimens with PT results in enhanced expression of IL-17A. A, Real-time PCR data for IL-17A RNA transcripts in duodenal biopsy specimens of eight normal controls and seven inactive CD patients, either left untreated (unstimulated) or treated with PT or untreated BSA for 24 h. Levels are normalized to β-actin. Data indicate mean ± SD of all of the experiments. B, Representative dot-plots showing IL-17A expression in duodenal CD4+, CD8+, CD4+CD8+, and CD4−/CD8− cells extracted from biopsy specimens taken from one inactive CD patient and either left unstimulated or stimulated with PT or untreated BSA for 24 h. At the end of culture, LPMCs were isolated, stained with anti-CD4, anti-CD8, and anti–IL-17A, and then evaluated by flow cytometry. One of three representative experiments is shown. Although human IL-17A was originally identified in 1995 (30), it was only recently shown that this cytokine is produced by a distinct CD4+ T cell lineage, termed Th17 cells, which are critically responsible for the control of host defense against pathogens (7–9). Th17 cells have been linked to various autoimmune disorders, being able to make a constellation of inflammatory cytokines other than IL-17A, including IL-17F, IL-21, IL-22, and, in humans, IL-26 (9, 20). In this study, we analyzed the expression of IL-17A in CD. Our data indicate that IL-17A is produced at a higher level in active CD patients than in controls. In contrast, IL-17A was expressed at the same level in inactive CD patients and normal controls. While this study was ongoing, Castellanos-Rubio et al. (31) showed that IL-17A is upregulated in CD duodenal mucosa. However, IL-17A expression was assessed only at the RNA level and in whole biopsy specimens, thus leaving unexplained which cells make IL-17A and how IL-17A is regulated in CD. Our data indicate that in the duodenum of both CD patients and controls IL-17A is produced mainly by CD4+ cells, thus supporting previous studies showing that IL-17A is constitutively expressed by lamina propria intestinal CD4+ T lymphocytes (20). By flow cytometry, we were also able to show that IL-17A expression is more pronounced in CD4+ cells isolated from the inflamed duodenum of CD patients than those from controls. Another major source of IL-17A was CD4+CD8+ cells, and again this was more evident in active CD. Notably, ex vivo organ culture experiments revealed that treatment of duodenal biopsy specimens taken from inactive CD patients with PT enhanced IL-17A production by both CD4+ and CD4+CD8+ cells. Therefore, these results collectively would seem to indicate that the upregulation of IL-17A in CD is not simply due to the increased infiltration of the mucosa with activated T lymphocytes but rather is the result of the long-term effects of dietary gliadin. Although factors or mechanisms controlling the differentiation of murine Th17 cells have been extensively characterized (32), less is known about the regulation of human Th17 cells. It was recently shown that virtually all of the IL-17A–producing CD4+ T cells express the marker CD161 (21), the human equivalent of the murine NK1.1, suggesting the possibility that CD161 may represent a useful marker for human Th17 cells. 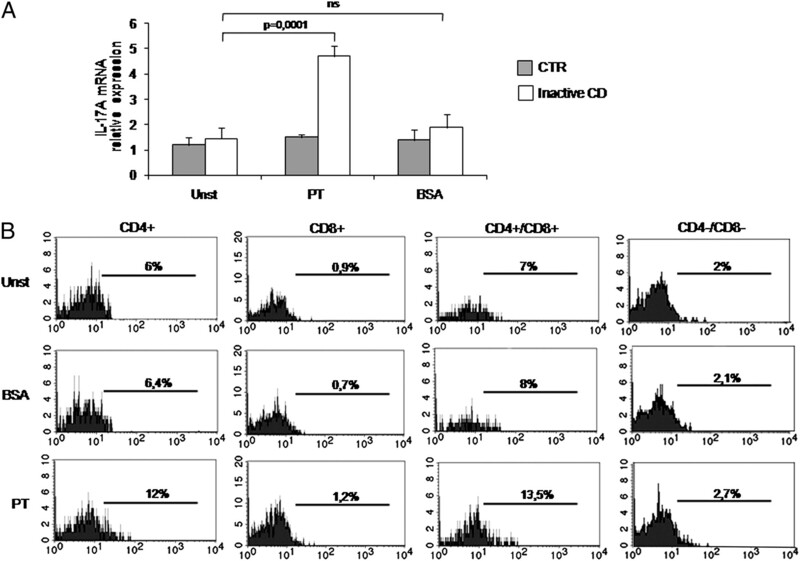 Flow cytometry of freshly isolated mucosal cells of active CD patients revealed that CD161 is preferentially expressed by CD4+, CD8+, and CD4+CD8+ cells. Nearly 50% of CD161+ cells produced IL-17A, thus expanding on previously published data showing that intestinal CD161+ cells produce inflammatory cytokines such as IFN-γ and TNF-α (33). In contrast to data published by Cosmi et al. (21), we showed that the vast majority of IL-17A–producing cells were CD161−. The reasons for this discrepancy remain unclear. A possibility is that it may in part rely on the timing selected to analyze CD161 in cultured cells. In fact, we evaluated the expression of CD161 in cells activated in vitro for 5 h, whereas Cosmi et al. (21) performed their analysis in cells activated for 7 d. It is also possible that the reduced expression of CD161 on IL-17A–producing cells in CD is due to the fact that these cells are not classical Th17 cells. Indeed, in CD, significant proportions of IL-17A+ cells coexpressed IFN-γ. This latter observation fits well with results emerging from studies performed in other chronic inflammatory disorders and showing that human Th17 cell clones can be induced to express T-bet and secrete IFN-γ when cultured in vitro in the presence of Th1-inducing stimuli (34). Consistent with this hypothesis is also the observation that IL-22, another marker of Th17 cells, was expressed at the same level in mucosal CD3+ T cells isolated from active CD patients and controls. The mechanisms that lead to the overexpression of IL-17A in CD remain to be elucidated. It has been previously shown that murine Th17 cells originate from naive CD4+ T cells in the presence of IL-6 and TGF-β1 and that their development is stabilized, amplified, or both by IL-23 and IL-21 (35). Although there is some discrepancy among data generated from studies with human Th17 cells, it seems that even the differentiation of human Th17 cells requires the activity of TGF-β1, whereas IL-23 is necessary for maintaining the polarized Th17 phenotype (35, 36). We feel that it is unlikely that, in CD mucosa, naive CD4+ T cells are induced to differentiate in situ along the Th17 pathway in response to TGF-β1, because in CD there is defective TGF-β1 activity due to the IL-15–driven activation of JNK, which is known to antagonize TGF-β1 signaling (37). Similarly, in active CD mucosa, there is no expression of the IL-23/p40 subunit (38), thus arguing against the possibility that IL-23 may play a decisive role in the regulation of IL-17A–producing T cells. It is thus possible that Th17 cells primed in the intestinal secondary lymphoid organs seed the mucosa of CD patients, where locally produced molecules enhance IL-17A expression. Data from the current study suggest that IL-21 may be involved, because blockade of IL-21 activity in mucosal explants of active CD patients reduces IL-17A levels. Moreover, stimulation of biopsy specimens from inactive CD patients with anti–IL-21 inhibits the gliadin-driven induction of IL-17A. We would however like to point out that these studies were conducted using organ cultures of whole biopsy specimens and not purified cell types, because we were not able to purify sufficient mucosal cell types from cultured biopsy specimens to carry out these mechanistic studies. Thus, it remains unclear whether IL-21 selectively controls the fates of IL-17A–producing T cells, cells coexpressing both IL-17A and IFN-γ, or both. The latter appears to be more likely, because we previously showed that IL-21 plays a key role in the amplification of Th1 cell responses in CD (16). Our studies were not designed to explore the functional role of IL-17A in CD. It is however tempting to speculate that, in CD, IL-17A could help to maintain or expand the tissue-damaging inflammatory reaction. Indeed, several studies have previously shown that IL-17A contributes to amplify pathogenic responses in various organs by acting mainly on parenchymal cells (39, 40). Another possibility is that IL-17A acts as a counter-regulatory molecule that limits the detrimental effects of Th1 cells rather than driving inflammatory signals. This is supported by the recent demonstration that IL-17A–deficient T cells cause severe Th1-mediated gut inflammation when transferred into recipient mice (13). Studies are now ongoing to examine the functional role of IL-17A in CD and to establish whether and how IL-17A–producing cells interact in vivo with other regulatory and effector mucosal T cell subsets. This work was supported by the Fondazione Umberto di Mario, Rome, and Giuliani SpA, Milan, Italy. 2002. Coeliac disease: dissecting a complex inflammatory disorder. Nat. Rev. Immunol. 2: 647–655.
. 2005. Gliadin as a stimulator of innate responses in celiac disease. Mol. Immunol. 42: 913–918.
. 2004. Regulation of the T helper cell type 1 transcription factor T-bet in coeliac disease mucosa. Gut 53: 1090–1095.
. 1995. Histological changes in small bowel mucosa induced by gliadin sensitive T lymphocytes can be blocked by anti-interferon gamma antibody. Gut 36: 874–879.
. 2005. A distinct lineage of CD4 T cells regulates tissue inflammation by producing interleukin 17. Nat. Immunol. 6: 1133–1141.
. 2007. TH-17 cells in the circle of immunity and autoimmunity. Nat. Immunol. 8: 345–350.
. 2003. Increased expression of interleukin 17 in inflammatory bowel disease. Gut 52: 65–70.
. 2007. T cell self-reactivity forms a cytokine milieu for spontaneous development of IL-17+ Th cells that cause autoimmune arthritis. J. Exp. Med. 204: 41–47. 2008. T-helper 17 cells in psoriatic plaques and additional genetic links between IL-23 and psoriasis. J. Invest. Dermatol. 128: 1064–1067.
. 2007. IL-21 is produced by Th17 cells and drives IL-17 production in a STAT3-dependent manner. J. Biol. Chem. 282: 34605–34610.
. 2007. IL-21 initiates an alternative pathway to induce proinflammatory TH17 cells. Nature 448: 484–487.
. 2008. Interleukin 21 contributes to the mucosal T helper cell type 1 response in coeliac disease. Gut 57: 887–892.
. 2007. A functional role for interleukin-21 in promoting the synthesis of the T-cell chemoattractant, MIP-3α, by gut epithelial cells. Gastroenterology 132: 166–175.
. 2005. Interleukin-21 enhances T-helper cell type I signaling and interferon-γ production in Crohn’s disease. Gastroenterology 128: 687–694.
. 1990. 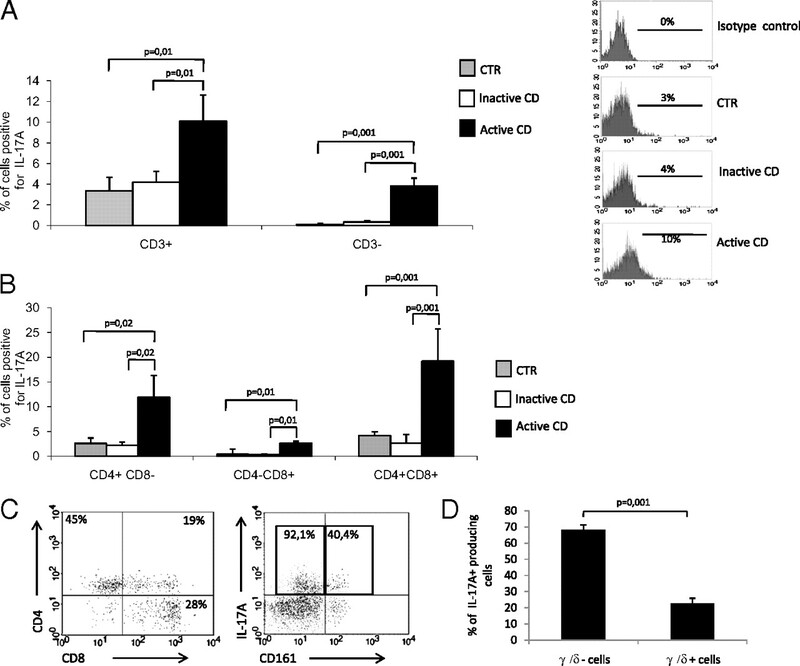 Subsets of CD3+ (T cell receptor α/β or γ/δ) and CD3− lymphocytes isolated from normal human gut epithelium display phenotypical features different from their counterparts in peripheral blood. Eur. J. Immunol. 20: 1097–1103.
. 2007. IL-17 family cytokines and the expanding diversity of effector T cell lineages. Annu. Rev. Immunol. 25: 821–852.
. 2008. Human interleukin 17-producing cells originate from a CD161+CD4+ T cell precursor. J. Exp. Med. 205: 1903–1916.
. 2006. IL-17 production is dominated by γδ T cells rather than CD4 T cells during Mycobacterium tuberculosis infection. J. Immunol. 177: 4662–4669.
. 2007. Interleukin-22, a TH17 cytokine, mediates IL-23-induced dermal inflammation and acanthosis. Nature 445: 648–651.
. 2007. Interleukin-22 but not interleukin-17 provides protection to hepatocytes during acute liver inflammation. Immunity 27: 647–659.
. 2008. Innate and adaptive interleukin-22 protects mice from inflammatory bowel disease. Immunity 29: 947–957.
. 2007. IL-6 programs TH-17 cell differentiation by promoting sequential engagement of the IL-21 and IL-23 pathways. Nat. Immunol. 8: 967–974.
. 1995. Human IL-17: a novel cytokine derived from T cells. J. Immunol. 155: 5483–5486.
. 2009. TH17 (and TH1) signatures of intestinal biopsies of CD patients in response to gliadin. Autoimmunity 42: 69–73.
. 2008. Th17 cell differentiation: the long and winding road. Immunity 28: 445–453.
. 2004. Diverse populations of T cells with NK cell receptors accumulate in the human intestine in health and in colorectal cancer. Eur. J. Immunol. 34: 2110–2119.
. 2009. Late developmental plasticity in the T helper 17 lineage. Immunity 30: 92–107.
. 2008. Induction and effector functions of TH17 cells. Nature 453: 1051–1057.
. 2007. TH-17 differentiation: of mice and men. Nat. Immunol. 8: 903–905.
. 2007. Inhibition of TGF-β signaling by IL-15: a new role for IL-15 in the loss of immune homeostasis in celiac disease. Gastroenterology 132: 994–1008.
. 1998. Gluten induces an intestinal cytokine response strongly dominated by interferon gamma in patients with celiac disease. Gastroenterology 115: 551–563.
. 1998. Interleukin-17. Int. Rev. Immunol. 16: 541–551.
. 2004. Interleukin-17 family members and inflammation. Immunity 21: 467–476.